We reproduce below the translation of the affidavit written by Rizana Nafeek on January 30, 2007 which was published by the Asian Tribune today. This affidavit gives, for the first time, her version of events relating to the death of a four-month-old infant who she was bottle feeding. She was later charged with murdering the infant and was sentenced to death by beheading on June 16, 2007 after already having spent over two years in jail as the date of the incident was May 25, 2005. An appeal was filed on July 16, 2007. All previous information on this incident was based on communications with the Sri Lankan Embassy in Riyadh. Several days after the death sentence was pronounced the BBC Sinhala Service aired the story of a Sri Lankan domestic worker being sentenced to death in Saudi Arabia and that the last date for an appeal to be launched was July 16. 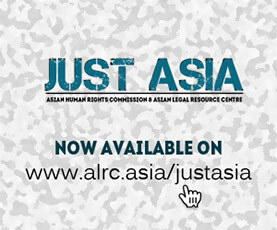 The Asian Human Rights Commission thereafter contacted the Embassy in Riyadh and learned that due to a prevailing government rule, not to provide financial assistance to Sri Lankan workers facing convictions before foreign courts, the embassy was unable to assist Rizana Nafeek in the filing of an appeal. The Embassy however, informed the AHRC that they had contacted a firm of attorneys, Kateb Fahad Al-Shammari but that the Embassy was unable to pay the fees demanded by the firm for filing the appeal. The AHRC thereafter wrote to Dr. Palitha T.B. Kohona, Secretary of the Ministry of Foreign Affairs, requesting him to support this appeal financially irrespective of the prevailing rule. This letter is also reproduced below. Having received no reply the AHRC came to an agreement with the Sri Lankan Ambassador in Riyadh that the AHRC would help to raise the necessary funds and the Embassy would continue to work with the firm of Kateb Fahad Al-Shammari to file the appeal. Accordingly the fees were transferred and the appeal was filed on the last day available for the appeal, July 16, 2007. The affidavit that was published today by the Asian Tribune would have been known to the Sri Lankan Embassy in Riyadh but it was never revealed to the public. The Asian Human Rights Commission in its many appeals on the case has consistently maintained that no forensic enquiry was ever conducted into the death of the infant and there was no evidence at all to indicate any circumstances which would suggest any wrong doing on the part of Rizana Nafeek or to justify the charge of murder. All the circumstances reveal scandalous behaviour on the part of all those who were involved on behalf of the Sri Lankan government in dealing with this case. 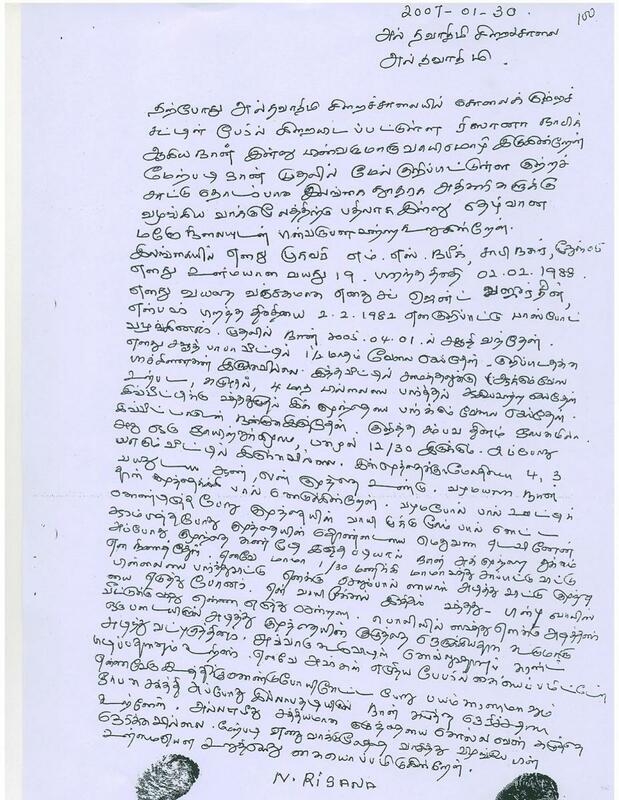 As this affidavit was written on January 30, 2007 Dr. Palitha T.B. Kohona himself should have been aware of this affidavit and Rizana Nafeek’s, version about the circumstances of the death. It must also be remembered that she was then a 17-year-old girl. The Sri Lankan government should immediately initiate a thorough and credible inquiry into the handling of this case by its Embassy prior to the filing of the appeal as well as throughout the appeal itself. It was the Embassy staff in Riyadh who liaised with law firm throughout the process of the appeal. According to the law firm they were liaising with the Embassy even after the death sentence was reconfirmed last year. We urge the Sri Lankan government to raise, with the Saudi Arabian government, its concern over the blatant injustice that is involved in charging this young girl with murder in this case, on sentencing her to death, on refusing her appeal and further, for keeping her imprisoned for over six years now. According to the information recently issued by the Asian Tribune she is now suffering serious psychological problems due to the incomprehensible nature of the communications that she has received on her death sentence and also due to her prolonged detention. We once again urge the world community, which has in the past shown an extraordinary concern to save Rizana’s life, to persist in their interventions with the Saudi Arabian government for her release. I have already made a first statement to the officials of High Commission of Sri Lanka on the above mentioned allegation. I am making this statement instead of the statement given to the officials of High Commission of Sri Lanka on this allegation. I am making this statement as I am in good mental condition. My address in Sri Lanka is – M.S. Nafeeq, Shafi Nagar, Muttur. My actual age is 19 years old. My date of birth is 02.02.1988. The sub agent called Bajurdeen deceitfully changed my date of birth as 02.02.1982 and issued me a passport whereas my actual date of birth is 02.02.1988. I arrived at Saudi Arabia on 2005.04.01 as my first visit. I was employed at the residence of my Saudi Madam for a period of 1 ½ months. There was no problem to narrate of. I was assigned to do cooking, washing and looking after a four months infant. As soon as I was brought to this house, I was employed to look after this infant. I had been amenable and maintained good rapport with the house people. The inadvertent incident, I could not recollect the date of the incident, happened at about 12.30 p.m on one Sunday. The house people whosoever was not at home at that time. In addition to the four months old infant, there were male and female children as well. Usually, I am the one who used to feed milk to that four month-old infant. The day of the incident too, I fed the infant with milk. When I was feeding the infant, I noticed that the milk was oozing through the mouth and nose of the infant. I stroke the throat of the infant gently. As the infant was seen having its eyelids closed, I thought that it was snoozing.. The madam came home at about 1.30 p.m. and after having seen the infant, she assaulted me with slippers and hands and took the infant away. Blood oozed from my nose. Thereafter police came and took me into their custody. I was assaulted at the police station too. They assaulted me with belt and coerced me for a statement stating that I had strangled the infant. They intimidated me that I would have been killed in the event I was adamant not to give a statement to the effect that I strangled the infant and electrocuted, I would be killed. In these circumstances, I under duress placed my signature on the written paper they gave to me. They took me to another place and asked a question, As I was virtually in a state with loss of memory and in fear and frightened mood, I had happened to tell them that I strangled the infant. In the name of Allah, I swear and aver that I never strangled the infant. I hereby place my signature after having read this statement. I am sure you are aware of the death sentence pronounced on Nafeek Rizana of Mutur by a Court in Saudi Arabia and who is now awaiting the death sentence. She still has time for filing an appeal which has to be done soon. We have been informed that the Ministry of Foreign Affairs has been in contact with Nafeek Rizana’s family in Mutur. This family belongs to the lower income group and is totally unable to meet the cost of litigation which according to your embassy sources in Saudi Arabia amounts to about Rs. 600,000. We also understand that the father of Nafeek Rizana has met Foreign Ministry officials in Colombo and has already explained to them that the family does not have means to contribute to this appeal. We also understand that the Sri Lankan embassy in Saudi Arabia has already made representations to the Ministry of Foreign Affairs requesting funds to enable filing of this appeal. There also seems to be good grounds for appeal since the entire case had been conducted in a language not understood by her and also without any meaningful interpretation provided to her. She had also not been legally represented at the trial. She is also quite young and is said to have left for employment a few months ago when she was only about 17 years of age. Furthermore the totality of evidence against her is supposed to be a confession which she had later withdrawn. In a foreign country under such circumstances and being of such young age, it is quite possible that she may have made the confession under duress. Nonetheless, such defenses are hardly of much use within the legal system of Saudi Arabia. A Sri Lankan citizen particularly of that young age facing a criminal trial carrying the possibility of the death sentence which within the particular jurisdiction is carried out rapidly Rizana Nasik would have deserved legal assistance from the embassy of her country from the very beginning. However, even at this late stage, the Government of Sri Lanka owes it to this young Sri Lankan citizen to rapidly intervene and assist her. According to interviews in the media, it appears that what prevents granting her legal redress is some rule, regulation or policy that seems to deny legal assistance by the Sri Lankan Government to Sri Lankans migrating to other countries who are accused of criminal charges. I am sure you would agree that there is no legal basis to withdraw the protection that the government of a particular country owes to its citizens in this manner. Particularly, migrant workers who leave their countries for employment should not be deprived of legal protection merely because they are accused of some crime. As you are aware, the Sri Lankan Constitution recognizes the presumption of innocence of a person until proven guilty. It is hardly necessary to remind you of the fate of 4 other Sri Lankans who were beheaded recently one of whom was in fact sentenced only for 15 years of rigorous imprisonment. Even when that matter was being publicly discussed, Sri Lankan embassy officials in Saudi Arabia made promises to provide legal assistance to enable these 4 persons to reviews their cases even at that last stage. The President of the country at the time, Chandrika Kumaratunga made a public statement, which was published on the front page of some newspapers, that she will directly intervene with His Royal Highness of Saudi Arabia to seek pardon on behalf of these 4 persons. The present President as Prime Minister then and later as President also made several public statements assuring that all attempts would be made to assist the 4 persons facing death sentence. However, when the death sentence was in fact carried out, no one including embassy officials in Saudi Arabia was aware of it. We are writing this to bring to your kind notice the pitiful plight of this young woman and to urge you to take all appropriate actions to ensure that she will be provided with legal assistance to enable her to file this appeal. We also urge you to review any rule, regulation or policy that may exist obstructing the granting of protection owing to such a citizen. We hope that you will graciously and expeditiously intervene in this matter.